It may be worthwhile to go through the previous Parts also before reading this one. 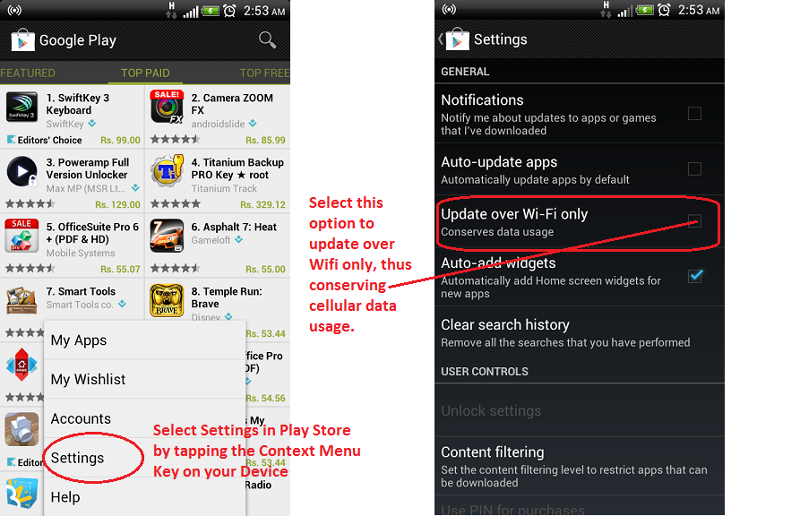 In this article, I will be concentrating on the "Google Play Store" feature of Android. This article can be used as a general guideline for most Android ICS phones but most of my Screenshots will display an HTC screen. They may look a little different on other phones but the basic menu structure is always the same and you can reach your goal using the advice accordingly. All images and names used in this Article belong to the respective manufacturers' devices / developers of the applications and have been altered only to mask confidential data. I do not own them nor do I have any interest in taking ownership of the same. I am using them here so that the reader can easily follow what I want to say. What is the "Google Play Store"? You should find it as an application installed on your phone under "All apps". Earlier known as "Android Market", the "Google Play Store" (or Play Store) is the place where users can download and install all sorts of applications, games and widgets for the Android Operating System. If you are a developer, you can upload your applications here for all Android users. In order to use the Play Store, you need to be logged in to a google (or gmail) account. This google account is tied to your device id(s) which you use when making purchases from the Play Store. In case of a factory format / hard reset when you lose all your phone data, signing in with the same google account prevents double payment of applications that you have purchased earlier. The home screen of Play Store features applications grouped in numerous ways that are enough to find your way deep down to the most popular apps. They are grouped according to category. Just drill down and you should find your way through. If you are not interested in browsing Category wise, then swipe right and you will find options for Featured / Top paid / Top free / Top Grossing and so on. See Image. 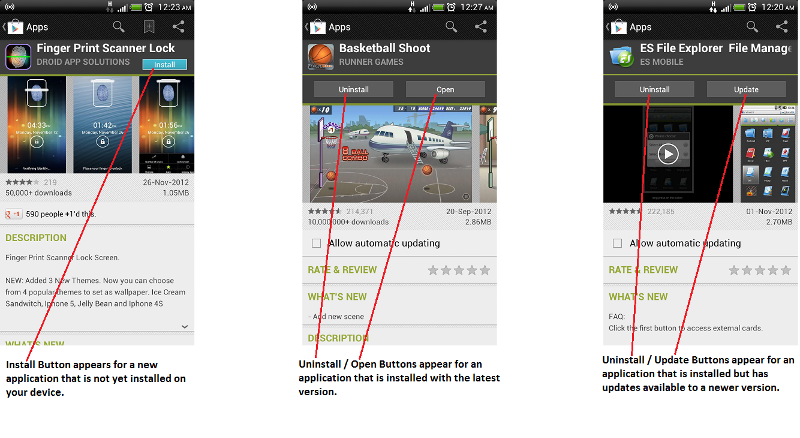 Like all top class magazines and programs, the Play store also follows a 5-Star Rating system. A higher score of Stars shows a greater level of acceptance by users who chose to install the application and rate it. If you are going to install an application that has reviews by more than 10,000 or more users, it will not be possible to read all the comments and will be a waste of time. To overcome this difficulty, you can leave out those comments which are not applicable to your device or filter out only those comments which were posted by users who were using a device similar to yours. 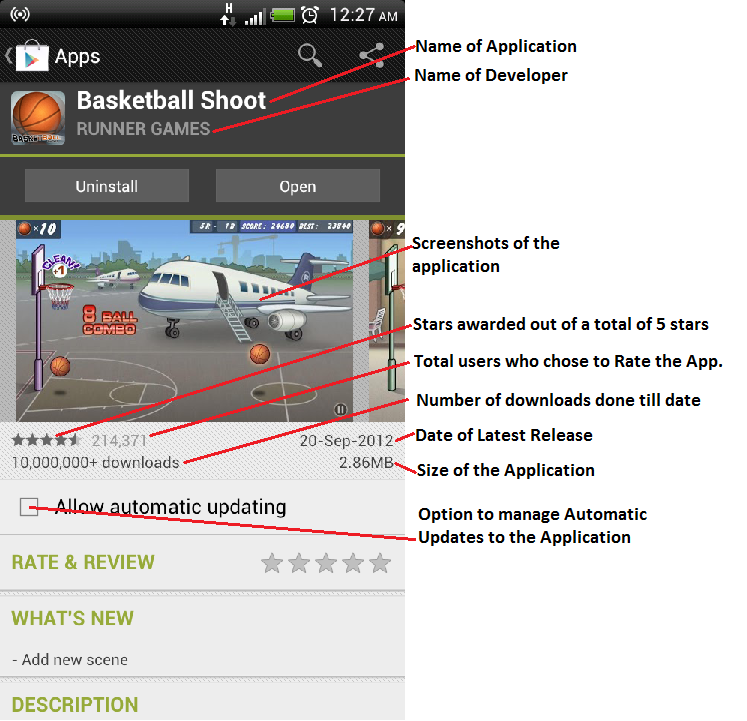 Overall, if any application satisfies 4.5 (or higher) Star Rating with more than 1,000,000 downloads, you will probably not be disappointed if you install and use that application. It may happen that your particular device model may not be fully supported and the same can be judged by filtering out the reviews as described above. 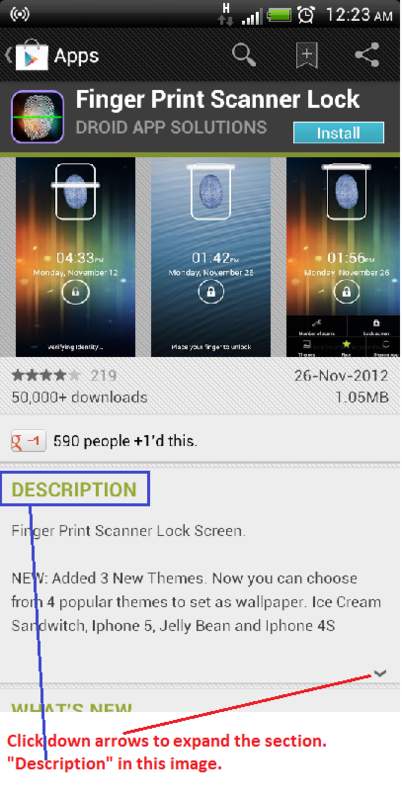 The Android OS clearly spells out an application's permissions before you install it on your device. You should judge an application accordingly and then decide if the permissions which the application is asking for are reasonable or not. For example, a Messaging application like Handcent SMS asking permission to read / write / send messages should be reasonable but a gaming application demanding the same will not be justified. For an application which is trustworthy by all means (like Kingsoft Office) but is large is size (say 20 MB) and you are on a limited cellular data plan; it may be worthwhile to disable "Auto-update" of the application. This is because every incremental update will result in the application being downloaded every once in a while (thus resulting in data usage bills), since the developers are constantly improving the application. 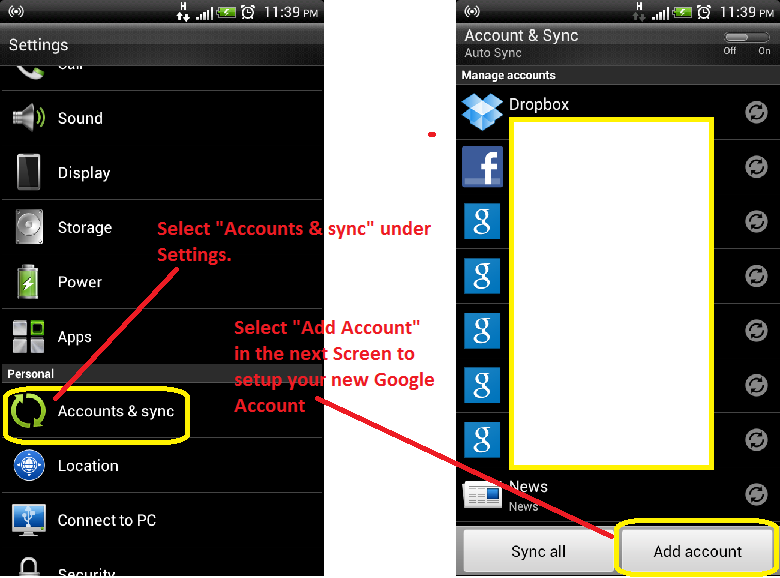 Using the native android user interface, you can easily backup your Contacts and Messages to your Memory Card or your Google Account. However, backing up applications isn't possible in the native Android OS. For this you will need ES File Explorer or Titanium Backup, which I will be discussing later. This is definitely not the last one of the series of HTC Sensation articles that I have decided to write and I'll be continuing it further with a Part 6.